Summer reading programs that rock! Reading rocks! If you think reading is boring, you’re probably reading the wrong books. There are books, comic books, graphic novels, ebooks, illustrated guides, and even cookbooks for everyone. Don’t let the summer by pass by without joining a summer reading program and immersing yourself in new worlds, new ideas, and new adventures – while getting rewarded for reading. * Libraries Rock! 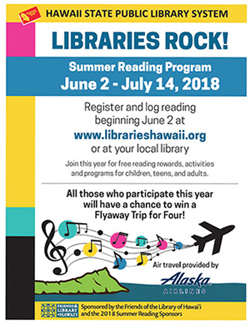 Hawaii Public Libraries Summer Reading Program, June 2 to July 14, 2018. Children, teens, and adults can join a free reading program, earn rewards, and attend fun programs throughout the summer. Register online and keep an online reading log at librarieshawaii.org. This year, there’s a chance to win a Flyaway Trip for Four from Alaska Airlines. Stop by the Hawaii State Library on Saturday, June 2 and join the Summer Reading Kick-Off, featuring books, fun activities, refreshments, and music by The Tongan Sisters! If you want to share your opinions and ideas with other readers, join a book club at your local library. Hawaii public libraries in Aiea, Hawaii State (main branch), Kailua, Kaimuki, Kapolei, Makawao, North Kohala, and Waianae meet monthly – check their website for a complete list of book clubs and eBook clubs. * The Barnes & Noble Summer Reading program, May 15 to September 3, 2018. Elementary students in grades 1-6 can read 8 books, record them in the Reading Journal, and turn it in at Barnes and Noble for a free book from the book list – to keep, share with a friend, or donate to their classroom library. Download a free printable Reading Journal to help kids keep track of the books they read and their favorite parts. There are stores in Honolulu, Oahu and Lahaina, Maui. What books will you read this summer? Which books are on your “want to read” list? 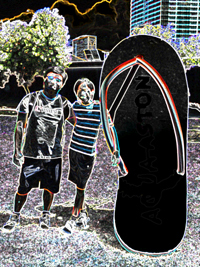 I left my sole at the Charity Walk. We woke up early Saturday morning, packed our water bottles and sunblock, and joined the Visitor Industry Charity Walk at Ala Moana Beach Park. It was a beautiful day, with blue skies and a cool breeze. Ala Moana was filling with people leisurely converging on McCoy Pavilion. This walk was a perfect event for our family. It gave us a chance to talk and enjoy the morning without television, smart phones, or computers. My husband could sample snacks and treats from hotels and restaurants. My son would be rewarded for reaching each checkpoint. And I could support an even that raises money for Hawaii nonprofits. We picked up our walk bracelets and stamp cards, and listened to the music and welcome speeches. We were in the first “wave” of walkers, and strolled casually down Ala Moana Blvd., down Kalakaua Avenue, and back through Kalia Road to Ala Moana Blvd. No one was in a hurry. “Be prepared to gain weight,” they warned us. They weren’t kidding. Along the 5.25 mile course, there were 17 stations with food and drinks. Hotels, restaurants, and businesses offered everything from water, POG, and cantaloupe tapioca to granola bars, fruit, cookies, SPAM musubi, and kalua pork tacos. The most beautifully-presented treat was a paper tray with a crab salad slider and sweet pineapple cornbread dessert from the Halekulani and Waikiki Park Hotel. The most elaborate offering was a small Chinese take-out box with fried rice from the Hilton Hawaiian Village. There were some unexpected joys along the way: cold towels at the turn-around point from the Waikiki Resort Hotel, a plumeria flower from the Royal Hawaiian Center, and a Cool Zone that sprayed misty water from the Prince Waikiki. Though they served us snacks along the way, they also offered us breakfast from the Hyatt Regency Waikiki before the walk (we went straight to the starting line) and lunch from Kyo-ya – sausage hotdogs with chili, salad, fruit, and a shortbread cookie or energy bar. Mahalo to all the course marshals and volunteers, who prepared and served food, gave us directions and encouragement, handed out water and snacks, and entertained us along the way – live music, hula dancers, Kamehameha High School cheerleaders and the McKinley High School Band – and the police who looked out for us. I am so thankful to the Hawaii Lodging and Tourism Association for organizing this event every year to give back to the community. I really enjoyed my first Visitor Industry Charity Walk. It was lively, entertaining, and very delicious, and I plan to make this an annual family event! Next year, I’ll remember to bring a plastic bag or container – and I hope to see recycle bins along the course. So, how did I lose my sole? Not far from the starting line, before we even reached the first checkpoint, the sole of my shoe started to detach. By the time we reached the Ala Wai Promenade, it came off completely. I walked gingerly, with a slight limp, for the rest of the walk. But I made it through the checkpoints and to the finish line. What is your favorite local race or walk? What other activities do you do as a family? I work for a small nonprofit organization in Hawaii, and it was eye-opening to enter the mysterious world of health insurance coding and billing. I gained a new appreciation for my doctor (aka primary care physician), my son’s pediatrician, my dentist, and my optometrist. Earlier this year, I shared some stories about the sometimes confusing and frustrating health insurance claims process. But it doesn’t end there. Some people have multiple health insurance policies. These secondary claims are tricky. The secondary plans often, but not always, pay the copayment or coinsurance (aka the “patient’s responsibility”). The secondary plans sometimes, but not always, pay for services that the primary plan does not cover. 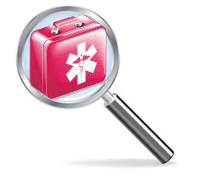 Healthcare providers have to verify which insurance is primary. We have to verify which claims are forwarded (“crossover”) automatically, and which must be submitted manually. Sometimes we have to identify that there is a secondary plan, to avoid duplicate billing. Why is there a payment and denial? The best insurance plans are the ones that automatically forward claims to the secondary plan – and let you know it upfront. We submitted a claim to Payer A1, and received a payment. Then we submitted a secondary claim to PayerA2, and received a payment – as well as a denial notice. Why? Because we sent a duplicate claim. That’s when we found out that Payer A1 automatically forwards claims to Payer A2. The two copayments. We submitted a claim to Payer B1, and received a payment, along with a notice that the client had a copayment. The client paid the copayment. Then we received a payment from Payer B2. We didn’t know that the client had a secondary plan and we didn’t know that Payer B1 automatically forwarded claims to Payer B2. We refunded the client, with our apologies. Why did they pay? We submitted a secondary claim to Payer C2, and received more than we expected. We immediately called Payer C2 to let them know about the overpayment, and set the check aside. Three months later, we received a letter saying that an “audit” uncovered the overpayment. Payer C2 demanded repayment – even though we never deposited the check – and threatened to deduct the amount from future payments, without apologizing for their mistake. Why didn’t they pay? We submitted a claim to Payer D1, and received a payment, along with a notice that the client had a copayment. We submitted a secondary claim to Payer D2 for the copayment, but received a denial letter. Their explanation: the amount Payer D1 paid was more than the amount Payer D2 would have paid as the primary plan (even though Payer D2 is not the primary plan). Are you satisfied with your health insurance plan(s)? Are your health care premiums affordable? What about your copayments or coinsurance? I work for a nonprofit mental health counseling center, and I was happy to realize that the Hawaii Book and Music Festival expanded their program to include Wellness in Hawaii. Books and music strengthen our mind and spirit, and it seems natural to include to mental and physical health. Because my son is entering the teen years, I was drawn to a panel discussion on “Anxiety, Depression, Teenage Suicide.” It was moderated by University of Hawaii professor Maya Soetoro-Ng, who began the discussion by revealing how teen suicide has touched her personally. There were five panel participants: psychologist and director at Waimanalo Health Center Sid Hermosura; child and adolescent psychiatrist Sonia Patel; author, professor, and founding director of the Stress Reduction Clinic Jon Kabat-Zinn; psychologist Julie Takashima-Lacasa; and professor Thao Le, who called for a sense of joy and excitement even when talking about serious issues. Maya began the discussion by asking, “In a time of great connectedness, why are we so lonely?” Aside from genetic reasons, family situations, and financial circumstances, there was a general consensus that screen time and social media contribute to a sense of loneliness and disconnectedness. With screen time, “[teens] get caught in their heads,” Sonia said, and parents don’t want to upset kids by limiting it. Julie added that screen time is highly associated with depression, and teens who use over five hours of screen time are 71% more likely to be depressed. We need to teach teens tools to manage social media, Sid urged, because “likes” and number of followers can become tied to self-esteem. Thao added that we can become addicted to immediate responses and “likes,” and social media makes it too easy to compare and judge ourselves against others. What solutions are out there? asked Maya. We need to teach mindfulness in schools, Jon recommended, “we need to cultivate emotional intelligence.” Julie agreed, saying that we need to “cultivate self-awareness” and teach emotional regulation so that we can make better decisions. “Anxiety and depression are not individual problems, it’s a collective problem,” Thao stated. She advocated aina-based learning, where we can connect to nature and each other. Sonia offered three everyday suggestions: sleep, meals with family, and less screen time. Sid suggested that primary care physicians and pediatricians can screen for anxiety and depression. There wasn’t much time for questions from the audience, but a family court judge asked about ways we can address trauma in teens. Sonia said that in her practice, she helps teens identify trauma, separate trauma from their self, re-write the way they respond to danger to make better choices, and learn what triggers will trick your brain into making poor choices. The panel discussion opened and closed with performances by singer/songwriter PraiseJesus Artis. I wish we had more time to discuss the programs that are already in place to help teens, and perhaps even hear from young adults who experienced teen anxiety and depression. On this day, to the sounds of music and the murmur of readers, the conversation was just beginning. The optimistic, altruistic world view of Star Trek caught my imagination when I was young – and I’ve been a loyal fan over the years. Seen through young eyes, Star Trek was a universe of possibility, good intentions, and people striving to do the right thing. But I never questioned whether the Star Trek society and economy could work in the future – or be a role model for us today. 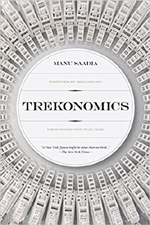 So I was intensely curious to read “Trekonomics: The Economics of Star Trek” (2016), published on the 50th anniversary of Star Trek, by author and Star Trek fan Manu Saadia. According to Saadia, “The world of Star Trek is an economic utopia” based on universal abundance and automation of labor. It is “the world that awaits us on the other side of that great social metamorphosis.” Saadia explores the economics of Star Trek, as well as the psychology of its members, capitalism and the Ferengis, and real-world Treknomics. Saadia identifies six characteristics of the Star Trek economy, starting with the absence of money in Star Trek: The Next Generation (though he acknowledges that money may still be used outside of Starfleet). Note: With my apologies to the author, I re-ordered his discussion a bit. I’m not an economist, but I think the presence or absence of money is irrelevant; the game-changer that revolutionized the economy was the replicator. There is no scarcity. With the invention and public availability of the replicator (a device that can almost instantaneously create food and goods on demand), there are unlimited resources, and there are no barriers to economic growth or population expansion. Humans do not worry about survival (food, clothing, shelter, war), so they are more mentally stable; and reason and altruism become the norm. There is less poverty, lower child mortality, higher literacy rates, lower crime, and higher life expectancy. There is no production or logistics. With the replicator, there is no need to find raw resources, produce goods, or transport them. Like the Internet with information or GPS with location, the replicator is a global (or interstellar) public good. All of the craft and art is in the design stage; once the template is created, it can be shared freely with everyone. There are no taxes. When everything is free and there is no lack of resources, the role of government is greatly diminished. The government does not need to discover or conquer other lands for natural resources, and does not need to tax people to fund government. The limited role of government and the anti-colonialism philosophy is expressed in the Prime Directive (non-interference with other societies, which requires sacrifice for the greater good and the acceptance that other societies may suffer). Money is obsolete. As Picard says, “The acquisition of wealth is no longer the driving force in our lives. We work to better ourselves and the rest of humanity.” This is only possible because there is near-absolute abundance – almost nothing is scarce. There is no conspicuous consumption, so wealth is no longer a marker of status, and private property is mainly sentimental. Reputation is the new currency. No one is required to work. If everything is available at zero cost, then no one is required to work for survival, and people volunteer to work (free labor). “Work exists to make you happy.” People choose to work to gain a sense of belonging, recognition, glory, self-expression, even philanthropy. Without salaries to measure success, work is based on meritocracy and egalitarianism. Without the need for profits, companies provide services and function with open-source innovation to better humanity. Free-riding is not a problem. When groups of people deplete resources they share in common (fossil fuels, clean air, fresh water), it is in everyone’s best interests to curb their use of the resource. However, some individuals or governments will choose to continue their consumption, relying on others to curb their use. And yet, many of us still dream of space exploration, and perhaps need the dream of an altruistic, optimistic Star Trek future. When my son was young, I read to him every day, took him to storytime at libraries and bookstores, and signed him up for summer reading programs. In elementary school, he loved reading the “My Weird School” books. I thought he was well on his way to being a reader. And then in middle school, things changed. A tablet, a smartphone, and YouTube began to overtake his reading time. One day I realized he hadn’t read a book in a few weeks. I casually suggested that he find a book to read, but inside I was at DEFCON 3. This week, April 30-May 6, 2018, Children’s Book Week, the annual celebration of books and reading, is partnering with Screen Free Week, when children, families, schools, and communities rediscover the joys of life beyond the screen. The theme of Children’s Book Week is “One World, Many Stories,” there’s a free downloadable Resources Kit with posters, bookmarks, activities, and more, illustrated by Jillian Tamaki. Books become even more important when you realize that, including multitasking, children ages 8-18 spend an average of 4.5 hours per day watching TV, 1.5 hours using computers, and more than 1 hour playing video games, according to a 2010 Kaiser Family Foundation study. These hours spent with screens can have a negative impact on learning. Screen Free Week, sponsored by the Campaign for a Commercial-Free Childhood, put together a persuasive and helpful Organizer’s Kit. I highly recommend the media literacy activities. One lesson is about needs vs. wants, in which kids count how many of the ads they see that are trying to get you to buy things that you really need. Another lesson is about being a product placement detective, challenging kids to spot the ads hidden inside television shows and electronic games. There’s also a pledge card, a certificate of achievement, and a list of 101 screen-free activities. 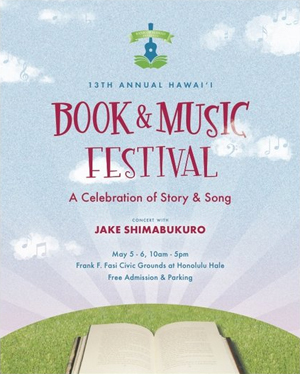 Crowning the week is the Hawaii Book and Music Festival, May 5-6, 2018, on the Frank F. Fasi Civic Grounds and Honolulu Hale. It’s a gathering that honors books, music, and story-telling, and promotes literacy and life-long learning. Beyond books, and music, there’s also a “Wellness in Hawaii” track with panel discussions about issues that affect our physical and mental health in the islands. What was the last children’s book you read? Will you go screen-free this week? You are currently browsing the Better Hawaii weblog archives for May 2018.